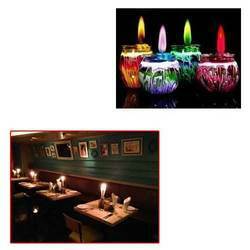 Pioneers in the industry, we offer colourful candles for restaurant from India. Under the strict supervision of our experienced professionals, we are offering an innovative collection of Colourful Candles for Restaurant. Our creative experts design these candles as per the latest market trends. In line with industry set standards, we provide our offered candles as per the ever evolving needs of our prestigious clients. The offered candles are the perfect example of contemporary artwork. We provide these candles to our clients at affordable prices.